Maslow’s Pyramid: The hierarchy of needs turned upside down. This place has allowed me to make a living, to establish many friendships with people all over the world, to find my true path in life, to experience a ton of personal, spiritual and professional growth. I am intensely grateful for all of it. I guess in these past few years I’ve been dwelling at the top levels of Maslow’s pyramid—the realms of self-esteem and self-realisation my favourite hangouts. I never gave it much thought, I was just feeling grateful and happy. The bottom part of Maslow’s pyramid, where all we can manage is fulfil our basic needs for survival, like food, shelter and safety, has never in my life even been on my mind as something that I would ever lack (apart from that one time when I was travelling in Bangladesh with two dollars worth of local currency in my pocket and not a bank to be found within a day’s travelling distance, and by the time of arrival the bank would be closed). Even though I do not come from money, never in my life have I lacked anything I really needed (I guess the trick lies in distinguishing needs from desires). 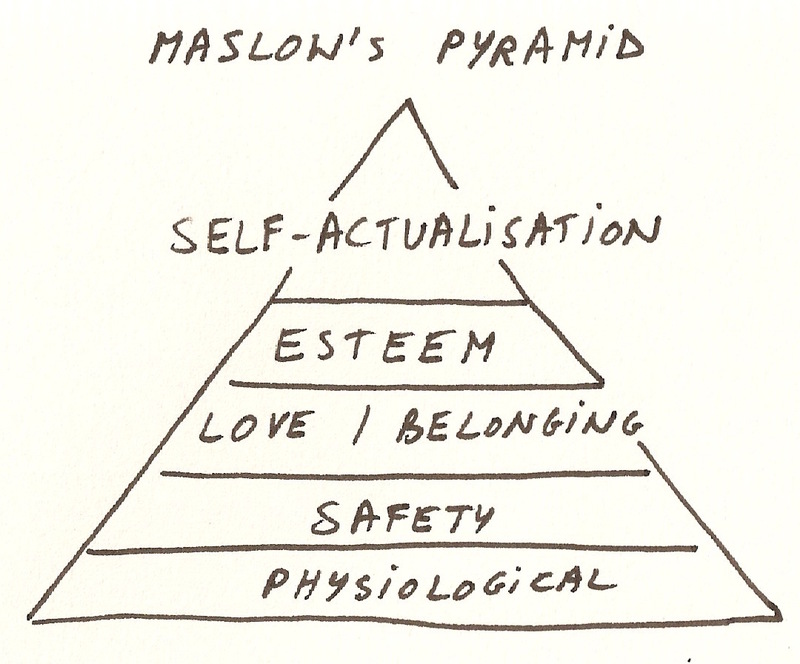 So here I was, “living that dream”, feeling very fulfilled—unwittingly dwelling at the top of Maslow’s pyramid. Then the chaos kicked in on the mainland on April 18 of this year. With the students in the lead, the people of Nicaragua have stood up against their president who is actually a dictator. While the protesters march peacefully, the government, by force of the riot police, has been reacting with violence from the very beginning of the protests. The police violence sparked the old revolutionary fire that was still smouldering in the hearts of most Nicaraguans. Still not using violence, they have blocked most main roads to cause disruption of traffic and thus of the lives of most citizens in the country to put pressure on the government. They have continued protest marches all over the country up till the date of writing, almost 7 weeks straight now, slowly coming into a continuous nationwide strike. Here on the island we are experiencing zero protests and zero violence, and life at first seemed to go its usual relaxed way. But then the road blocks threatened to stop all transport of goods. We are totally dependent on trucks carrying our supplies from the capital to a port, from where it travels by boat to the island. This includes all foods and the propane to cook it on. Spare parts for broken generators or transformers for the municipal electricity. Road blocks could mean no trucks, no boats, no supplies. This quite suddenly threw me off my cushy top of Maslow’s pyramid and made me tumble down to the lowest levels. Our basic needs. Water is not the biggest problem, because it is rainy season, so I can catch rainwater. Food is a bit more tricky. There are quite a few local fruits in season, and there are always coconuts. Fish is a bit harder to get by, if the fishermen run out of fuel for their boats. Apart from a few simple vegetables, we don’t grow much food on this little island. My bit of home-grown spinach and fresh herbs don’t add up to much. Most of our food comes from the mainland. Over the last few years, as part of my self-realisation process, I guess, I’ve become aware of one of my own behaviours, that I really didn’t like, and that didn’t serve me either. I had an attitude of scarcity. I was always afraid that I’d run out of something (I never did), that there wouldn’t be enough (there always was). At parties I would be one of those people hogging the buffet, afraid that I wouldn’t get my fair share (I always did, and who’s the judge of fair anyway). I found it always hard to share things I had, or to give freely. I’m not a hundred percent sure where this behaviour came from, since I have never lived in a situation of lack, not even as a child. Once I became aware of this scarcity mentality, based on a false belief of lack, I have been very consciously working on letting that attitude go. Because I’ve never lacked anything. For sure, I still have some work to do, but I have definitely gotten much better at it. But now, in the current situation where we might run out of everything, all of a sudden that scarcity thinking is more real than ever. Now there is a real risk of lack. Yesterday a transformer burned beyond repair and has left my small beach neighbourhood without electricity. Normally, a new transformer can be here within a few days, a week at the most. Now, it’s totally uncertain when it can arrive, since it has to come all the way from Managua, the capital. No electricity means sitting in the dark at night. That is not my biggest problem, since I go to bed early anyway. I have an e-reader and my computer, so as long as those are charged, I can do something other than staring at the full moon or the stars. But now, charging is an issue. Luckily other parts of the island do have light, so I can just go hang out in a cafe or at a friend’s house to charge all my “essential” gadgets. Here it becomes funny. I cannot let go of the idea that these things all need to be charged. I cannot be at ease with the idea that maybe I will have to spend a day without all the electronics. They are too much part of my comfort zone. So here my scarcity thinking is directly related to the comfort of being able to read, write, do research and connect with other people, and maybe get an update on the news too. I won’t die if I wouldn’t do all those things, even for several weeks or months. But somehow they are now part of, say, the second layer of my personal Maslow-pyramid. I guess when we’ve never experienced real lack, we still consider giving up our electronic luxuries an issue of scarcity. A sad conclusion. Who knows how soon I will have to rethink my priorities. Maslow’s pyramid seems to have a sliding scale, when you come down from the top. No electricity means no fan, which can be a bit hot and buggy, on a tropical island. But even that I can handle. I’m quite acclimatised, and for bugs there’s always a mosquito net. No electricity also means no fridge. Since I had just hoarded all that food, my fridge is full of fresh produce, which I’d hate to lose. That thought seems ridiculous, because the cost of those foods is low, compared to the cost of fuel for a private generator that can fuel a few lights, fans and fridges (there has already been a price hike in fuel, thanks to the trouble in the country). But since there’s no certainty that there are any fresh foods coming to the island anytime soon, all of a sudden they have become much more precious to me, and I’d hate to lose them to a lack of electricity. Scarcity thinking on a sliding scale. So here I am, sitting in the dark at the bottom of Maslow’s pyramid, with an extension cord plugged into a neighbouring house that does receive electricity from a little gasoline generator. To avoid over-burdening the little engine, I can only run my fridge, but no lights. I have, for now, the fan on low, because I am not in bed under my mosquito net yet, and the fan helps to keep the bugs away. When I go to bed, I will unplug the fan and give some life juice to my phone and computer. At least for tomorrow, I will have foods that haven’t rotten yet and charged gadgets that will allow me to edit and post this story. Whether my landlord will be able to find gasoline for the entire time that we have to wait for that transformer, is a worry that I will have to let go of, since I cannot do anything about it. When we’re in the uppermost layers of Maslow’s pyramid, we set goals, dream big and work towards the fulfilment of those lofty dreams. Big ambitions can come with lots of stress, though, especially for those who are not living on a little island in times of peace. We learn to meditate to combat stress. Meditation is our precious tool to stay sane on our arduous track to the top of Maslow’s pyramid. We self-realising people talk a lot about being present and living in the moment as the ultimate way of living a stress-free life. When we’re at the bottom of the pyramid, by default we live by the day because we never know what tomorrow will bring, what we will need then, what we will have or what we will lack. When there is a total lack of security, our life has the potential to become very stressful, if we let that threat of scarcity get the best of us. With all the scrambling we have to do to make things work, we have no time to meditate. But we do live from moment to moment, by default. Thank you, Universe, for providing me this revolutionary opportunity to work some more on letting go of my scarcity mentality. I’m not even close to permanently dwelling at the bottom of that pyramid yet, but I’m getting some valuable training with the few peeks I’ve had down there. Reporting from a country in chaos, trying to make sense of my own mind. This is part 7 of My (R)evolution, a series of contemplations inspired by the current revolution in Nicaragua. Missed an episode? Find them all here. (P.S. I wrote this episode a week ago. The new transformer arrived miraculously fast, so we had power again within 5 days. Back to “normal”).